Well, interestingly good news on the jobs front, it would appear. Again, the proviso: Don’t take any given month’s unemployment numbers too seriously. But that said, according to the “establishment survey” of places that hire, the economy added more jobs than predicted: just over 100,000. More significantly, the last two months’ numbers were revised upward by another 100,000 or so. Yet when we turn to the “household survey” of actual people, the headline unemployment rate remains unchanged at 9.1 percent. How come? The numbers suggest that the working-age population (16 and over) grew by 200,000 last month, and another 200,000 people rejoined the workforce – that is, are back looking for work. The household survey also shows that 400,000 more Americans were employed this month than last. So it’s a wash. Put another way, the number of officially unemployed remained constant at about 14 million. Disturbingly, our U-7 number actually went UP. How so? Because — and here’s the bad news in this month’s numbers — the total number of workers toiling part-time, but looking for FULL-time work, jumped by 400,000, about 5 percent. Since “part-time for economic reasons” are included in our U-7, the number rose from 18.26 percent to 18.41 percent, the third highest month since we inaugurated U-7 back in December. Making Sen$e web chief Elizabeth Shell, who computes our monthly U-7 number, adds the following observation: If the establishment survey number of 103,000 jobs added is correct, and the household survey suggests that 400,000 more people are working this month than last, then it might be the case that 300,000 or so jobs were waiting to be filled, but unable to find workers to fill them. To further confuse you with 0’s, remember (from above) that 200,000 Americans seem to have RE-ENTERED the workforce in September. Also remember that 400,000 more of us say we’re working part-time, but looking for full-time work. So maybe, just maybe, there were several hundred thousand part-time jobs waiting to be filled and finally, several hundred thousand workers who’d dropped out of the workforce entirely dropped back in to fill part-time slots. Again, you can’t read too much into any one month’s numbers — just look at the drastic nature of the revisions for July and August. But, hey, drop-outs becoming part-timers is a narrative that fits with the data we’ve got. 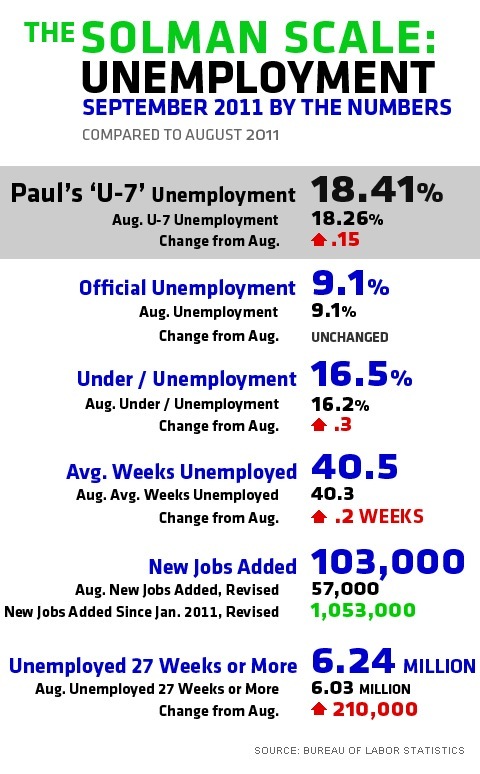 The graphic reflects a corrected number for ‘New Jobs Added Since Jan. 2011, Revised’ from an earlier version. Find all of Paul’s reporting on Making Sense. 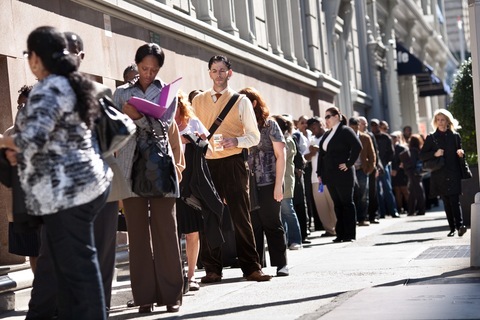 Job seekers wait in line outside the Metropolitan Pavilion before the start of a job fair in New York, U.S., on Sunday, Oct. 2, 2011. Photo byEmile Wamsteker/Bloomberg via Getty Images.